Fr. Stephen Dyas, LC, was born in a small town in Pennsylvania and raised in Reddick, IL. In 1989, during high school, he attended Immaculate Conception Apostolic School. Fr. Stephen was ordained a priest on December 22, 2007 in Rome. 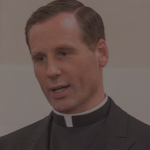 Since his ordination to priesthood he has worked in France and Montreal, Canada. Over the last three years he’s worked in New York City in development for Regnum Christi and the Legionaries of Christ, and is also a chaplain for the Lumen Institute.